I have a confession… I don’t ring my bell. Well – At least, I don’t ring it nearly as often as I used to. Along with a transition to a new office in a different part of town came an adjustment to the route of my commute. Now, instead of cutting through the heart of downtown amongst the traffic, I spend most of my time on Calgary’s pathway system. Now on the surface, this may seem like a perfect scenario, but the pathway system deals with a rush hour all to itself… Cyclists of every experience level, dog-walkers, runners, Tai Chi-ers, geese, ducks, squirrels and everything in-between. Prior to my new routing my time on the pathway was somewhat fleeting and through a much less populous area. During this time I rang my bell religiously, merrily ‘ting-tinging’ my way to work. But if I were to ring my bell with that level of frequency along my new route I’d end up ringing my bell faster than I’m turning the pedals. After looking at the interest generated by Shelon’s “Bicycles are traffic, not targets” article and being recently bombarded by the seemingly endless list of cycling-related ‘accidents’ (most publicly, the bike messenger allegedly killed by an Ontario AG) I was curious as to what (if any) sort of resolution can be come to between those behind the wheel, and those on top of two. 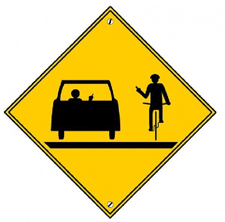 It’s probably safe to say that in most drivers eyes, cyclists are generally considered the scourge of the road. All we do is get in the way, and generally cause trouble. Having been in both scenarios (ie. behind the wheel, and on top of two wheels) I will admit that there are times cyclists are a little lenient with the ‘rules of the road,’ myself included. I’ve seen cyclist routinely blow through red lights, skim through traffic, and cruise through crosswalks full of pedestrians. But, as one of the commenters mentioned in our last article – that’s the beauty of being on a bike – you’re not firmly leashed to what a vehicle can and cannot do. With that said, I’m not certain the seemingly deep-rooted hatred drivers have for cyclists is founded. I might put forward that many of the problems stem mainly from one source: a drivers mentality.